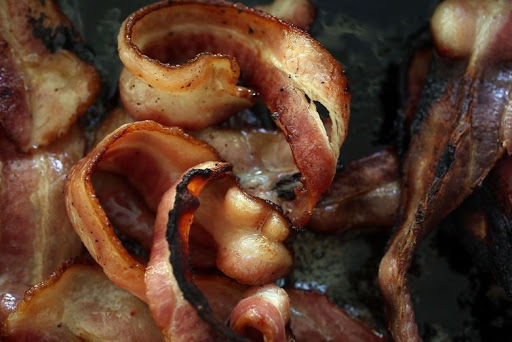 On Monday, the World Health Organization's International Agency for Research on Cancer (IARC) announced "there is convincing evidence" that eating bacon, salami, hot dogs, and other processed meats can increase the risk of cancer in humans. Sadly, that ushered in a lot of sloppy journalism and needless panic. Some news outlets are suggesting that processed meat is now considered just as bad for you as cigarette smoke. That is wildly false. The main thing the IARC established was a causal link between eating processed meat and certain types of cancer in humans, chiefly colorectal cancer. But the actual risk is quite modest - and far, far smaller than the cancer risks from smoking. Munching on the occasional bacon strip simply isn't that dangerous. The only thing this scale tells us is how persuasive the evidence is for a causal link between each substance and (at least one type of) human cancer. It doesn't tell us anything about how large the cancer risks are, or how dangerous each substance is. This is purely a statement about the state of the science on a very, very narrow question. Let's go through the scale. Group 1, the substances classified as "carcinogenic to humans," includes sunlight, cigarettes, and, now, processed meat. All this means is that, for each of these substances, there's compelling evidence that some amount of exposure can increase a person's risk of at least one type of cancer. Scientists are confident that high levels of sunlight can cause skin cancer. They're also confident that smoking can cause lung cancer. But the similarities end there. No one believes that sunlight and smoking are equally dangerous. Next on the list, there's Group 2A, substances that are "probably carcinogenic to humans." This category is a bit fuzzier. It means there's evidence that these substances can cause cancer in animals, but limited evidence for humans. Unprocessed red meat falls into this category. So do steroids. Again, that's a statement about the state of research, not about the risks involved. Then comes Group 2B, substances that are "possibly carcinogenic," which means there's limited or insufficient evidence for a cancer link in both animals and humans. Coffee falls into this category. So does gasoline. Scientists have found suggestive hints these things might be able to cause cancer, but much more research is needed. That's all. It'd be absurd to conclude that coffee and gasoline fumes are equally good (or bad) for you based on this classification. Ultimately, though, it's not terribly interesting if a substance can cause cancer. What's important is what the actual risks to people are. 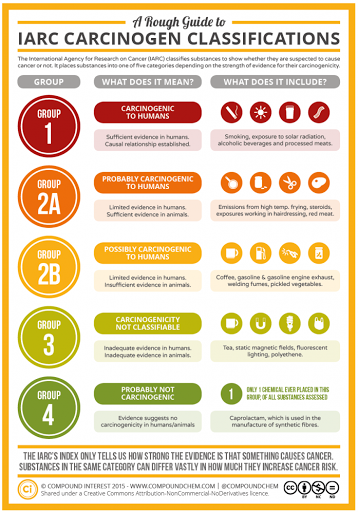 But to understand that, we have to ditch the IARC's classifications and dig into the numbers. So let's compare processed meat with smoking. The IARC estimated that eating 50 grams of processed meat daily - one hot dog, say, or two bacon slices - can increase your relative risk of colorectal cancer by 18 percent. That's way less scary than it sounds. In the United States, a person's lifetime risk of colorectal cancer is about 4.5 percent. So eating a hot dog every single day would bump that lifetime risk up to 5.3 percent. Eating more processed meat would nudge those numbers up further. But the overall risk is still fairly low. Now consider cigarettes. One 1994 study of Canadians found that the lifetime risk of lung cancer for male non-smokers was about 1.3 percent. But regular smoking increased that risk to 17.2 percent. The CDC likewise estimates that smokers are 15 to 30 times more likely to develop lung cancer than non-smokers, depending on the situation. This is clearly a much bigger worry than having a hot dog now and then. Keep this in mind whenever you hear that the WHO has classified some new substance as "carcinogenic" or "probably carcinogenic." It's one thing to establish causality. It's another thing entirely to tell us what the risks actually entail.